Dare to be scared with these ghoulishly gruesome fortune tellers. Some fortunes have been written for you, others are only half written so it is up to you to decide how the story will end and some have been left blank so you can invent your own weird and wacky fortunes and share these with your friends. Can you avoid the wicked witch's spell? Can you outrun the speedy vampire with his tooth grin? Or will you get caught in the blast of the snozzle-nose snot monster's sneeze? 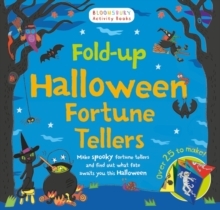 With colourful illustrations on every page, you can make creepy, crazy and completely hilarious Halloween fortunes for all your friends.